Ford Motor Company today celebrated the grand opening of the first authorized Ford dealership in Myanmar. Located in Yangon, the country’s commercial center, the new state-of-the-art facility officially establishes the presence of the Ford brand and global vehicles in the rapidly developing country. In April, Ford became the first global automaker to announce its brand’s official entry into Myanmar market through an agreement with the RMA Group, an emerging markets specialist with operations across Asia and Africa, and Capital Automotive Ltd., a subsidiary of leading Myanmar conglomerate, Capital Diamond Star Group. “Together with RMA Group and Capital Automotive, we are so excited and committed to serve customers in Myanmar with our world-class Ford vehicles and an unmatched ownership experience,” said David Westerman, regional manager, Asia Pacific Emerging Markets Group, Ford Motor Company. Built to Ford’s global design and operational standards, the new 2,600-square-metre facility includes a 12-vehicle showroom and 12-vehicle servicing capacity. 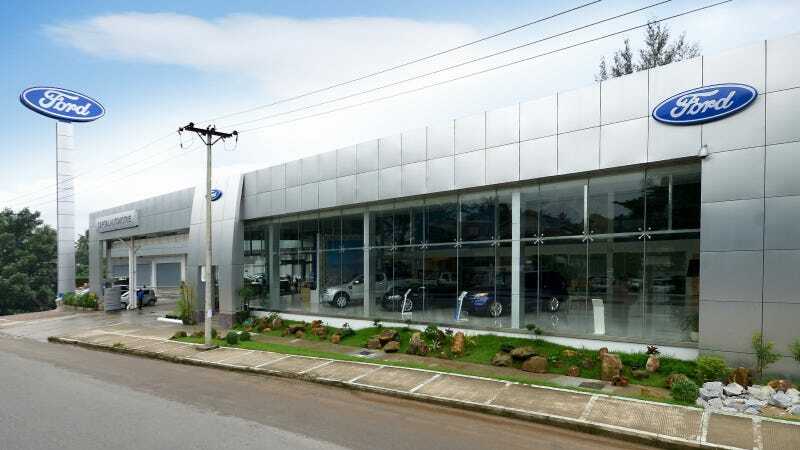 The dealership is located on Insein Road in downtown Yangon. “Every aspect of the facility has been designed and built to provide an industry-leading customer experience – which is so important to Ford, especially here in Myanmar, where for many people, a new Ford will be the first vehicle they have ever owned,” explained Westerman. The grand opening event showcased Ford vehicles that are already available in Myanmar, including the award winning all-new Ranger and iconic U.S. nameplates such as Taurus and Explorer. “Over the coming months, Myanmar customers will see a full showroom of global Ford cars, trucks and SUVs, representing all vehicle segments,” explained Westerman. The vehicles will be sourced and imported from Ford’s global production facilities, including North America, Europe and Thailand. “We plan to expand with facilities in other markets across the country as business grows, with a goal of quickly establishing a nationwide footprint for sales, service and parts,” said Ko Ko Gyi, owner and managing director of Capital Diamond Star Group. Today Ford also announced that the base manufacturer’s warranty on all Ford vehicles sold in Myanmar will be an industry leading five years/100,000 kilometres. “This unprecedented level of coverage reinforces Ford’s commitment to provide consumers with the best possible ownership experience. It truly demonstrates that we are bringing our global Ford vehicles to Myanmar,” stated Westerman. Since announcing entry of the Ford brand to Myanmar in April, the company has emphasized a commitment to investing in training resources and bringing in technical experts to provide skills training for employee technicians, sales and service people. To support this effort, RMA Group’s 25-years of automotive expertise is being leveraged by working with Ford to provide world-class training resources to build a team that is prepared for long-term success in the market. This includes sending technician apprentices to a month-long Ford Technician immersion program at RMA Academy’s state-of-the-art training facility in Laem Chabang, Thailand. The Academy’s curriculum covers a wide-range of services and skills, from learning how to carry out routine servicing to the more sophisticated repair requirements encountered on the job. The apprentices are also trained in electronics and measurements that are required of automotive technicians. Additionally, Ford recently flew in an experienced sales and management trainer from the U.S. to provide staff with training on the company’s global customer service standards. Entry of the Ford brand into Myanmar will help support the company’s overall growth strategy for the ASEAN region, which represents a combined population of 600 million. “This represents the latest step in Ford Motor Company’s aggressive expansion in Asia Pacific, and will help us to more fully realize the opportunity across the ASEAN region,” said Matt Bradley, president, Ford ASEAN. Ford is currently experiencing its largest industrial expansion in more than 50 years and anticipates that between 60-70 percent of its global growth by 2020 will occur in the Asia Pacific region.